"We have achieved nothing and are the laughing stock of the Pacific. Two people…TWO PEOPLE run this whole Country…that is a sham and disgrace." In our second story on the senior official who has revealed that the illegal regime of Frank Bainimarama is fragile, we can report further that the dictator is living in a state of total panic at the thought of being brought down. Our contact admitted in our first story that he believed in the cause 100 per cent but has since woken up to the corruption and the huge flaws in Bainimarama's leadership. He says others share his loss of faith and want free of the mess they're in. The senior official admitted that his own hands were not clean but pleaded for help to bring an end to the decayed administration of Bainimarama and his Number Two, Aiyaz Sayed Khaiyum. From further correspondence with him, we can confirm what we and others have been saying for some time, that there is huge fallout within the military ranks because the leadership is a sham. Our contact says Bainimarama and Khaiyum's smoke and mirrors campaign is fading fast and are so unpopular that Qarase would win hands down in a poll. He says Bainimarama has lost the plot and he and Khaiyum are living a life of lies, looting the country's coffers to feather their own nests. He also reveals that the man many have been pinning their hopes on, the illegal president Epeli Nailatikau, is a lost cause. Q)Why are they in panic mode? A)Simple answer, smoke and mirrors only lasts as long as the smoke lasts, and it’s fading fast, bro. If a straw poll was held today, Qarase would sweep back in like the Boxing Day tsunami. Q)When and where was the 2,000 bottle party - or is that par for the course? A)New Year’s, and #1 is pissed at least four nights a week, so is Pres. Nailatikau. you been to defense club recently? Q)What do you mean by ATM - give details. A)New gold/bling/watch/Rolex/clothes/and brand new personal Prime Bank account w/ANZ with over $275K. that does not come from civil service salary. we are servicemen, not idiots. i did not serve in sinai for this. Q)How fragile is fragile and what will it take to tip things over? A)It will take the boys in camp missing a few more paychecks or the boys in Namosi finally finding their courage or a new leader, or????. Q)Was Naliva paid to make sure Renee Lal got dealt to and who by? A)No, no, no pay, just following orders. Q)Intel has revealed the salaries of everyone on blogs - are the figures right? A)Just a party boy waiting ‘till #1 removes him. He knows his fate but no courage to change his fate. Q)Why did the regime tell FijiLive Aziz is still with the army? Was that just for show? A)It's complicated, he has as much blood on his hands and money in his pocket as anyone, but he knows about everything #1 and #2 have done and are doing. he is not so easy to put away. he and I are in same position, but he is happy to keep peace w/#1. i need to make my peace with Fiji. Q)Why have you become disillusioned? A)Bro, this is the easiest. I believed that reform was the goal of December ’06. But the Charter mess and on and on…we have achieved nothing and are the laughing stock of the Pacific. Two people…TWO PEOPLE run this whole Country…that is a sham and disgrace and I wish I could get out. But I am stuck….an old rooster…my kids can’t travel, I am ordering the arrest and beating of innocent people at the command of someone who has lost the plot. lost the plot, bro…it’s done. i am a religious man… I am ashamed of what I am doing. I need to make peace before its too late. So my question for you, bro…what is your plan? I have read your site and there is lots of talk, but does this really matter? I am putting it on the line because I am burnt no matter what. but what are you going to do??? we need help. ."
I HOPE GOD WILL BLESS YOU AND SOME ARMY OFFICERS WILL WAKE UP. BANI AND AG IS FILLING THE POCKET. BRO THE ARMY HAS TO KICK THEM OUT. WE WILL PRAY FOR YOU/FAMILY. I'm beginning to know the identity of this disillusioned stupid senior army officer. A very quietly spoken, humble and respectable person when he was studying at the Senior Staff college in Canberra in mid 2000. A classic lead guitarist and appears to be a decent family man. I got the shock of my life when I saw him barking out load in support of the coup in 2006 and early 2007. He is my mataqali and a friend but at this moment my advice to you Mata is be a man and be prepared to face the consequences of your action. Seek forgiveness from God first before you make peace with Fiji. A popular Fijian song we used to sing in primary school goes like this,"Tulia ni vuki Tulia ni dro Tulia ni dresulaka na bele ni vinivo. Kabata na vata caroba ki ra, Tulia na gone sa ca". Fellow bloggers you may know this song...please change the name Tulia to Pita. All of us here at home is okay to wait for the 2014 election. If there is a change in the regime it will be happen after the eclection and not in the way the outside SD pushing us to protest. We don't want our loving country to go back to zero level when we now see everything is back to normal and our currency is coming back very quickly. Please don't keep on fan the flame because you are not staying in Fiji to face the worst that might happen if we do what you are pushing us to do. 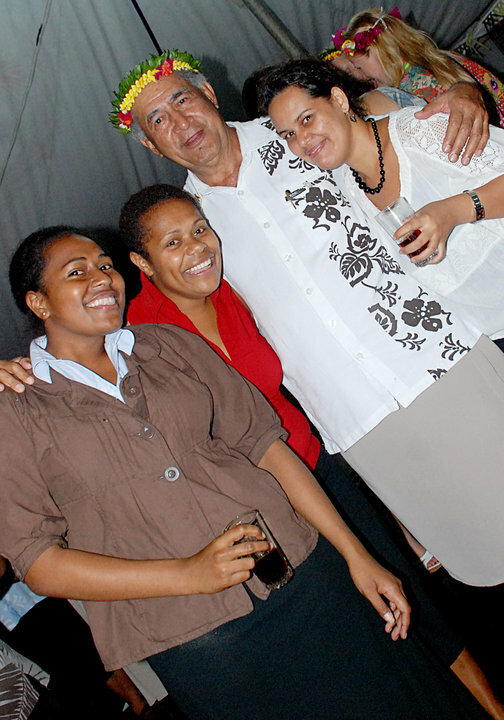 I am always amazed/surprised that EVERYTIME/ALL THE TIME Nailatikau goes [and it is VERY, VERY often] to BOTH the Defence AND United Clubs he FORCES himself into other patrons who are drinking together as friends. I am further amazed that it can't get through to him that he is not welcome. It can't get through to him that people just shut up like clams. Furthermore, he has this velavela kind of wit. Nailatikau, keimami sa da vosota ni o dau mai "commandeer" taka na neimami veitalatona e na Defence kei na United. E na daumaka cake mo drau laki gunu ga kei Voreqe e n keba. Bro shoot him if not give us civilian the gun and will shoot the arse hole. Last night Frank host the RFMF rugby team at his residence. The party and singing went on till this morning.Com Prison should be charge for driving under the influence of liquor, coming out from the same party early hours of this morning drunk. Shame...shame...shame.. The question you need to be asked and answer is will the soldiers kill to preserve their leader,because rest assured he will require it if necessary.So,this problem facing Fiji was caused entirely by the military.Hence the military now bears the responsibility,and you know exactly what comes next.It is within the power of the military TO FIX IT.So brave fighting men of integrity turn your weapons away from the unarmed civilian population and stand up to your own.You are shamed enough,lets see if this so called highly thought of army has ANYONE left with integrity. Oh yes and by the way,the good Lord is not going to help.This is a self help situation.The army/navy caused it so you guys can clean up your mess and at least lessen the yellow stain that runs forever through this force. Anon 10:22 - If WE do it it is NOT on. If THEY sing and party all night it is ok. It is the same old story - "DO AS I TELL YOU, BUT DO NOT DO WHAT I DO!!" If they can drive home pissed as hell it is ok. If WE do it - it is the slammer [Totogo cell]. Selective are they not? One word describes it all - DICTATORIAL!!! Before we descend to the Gaddafi, Mubarak scenario, what are our so called friends in NZ and Australia thinking of doing BEFORE we too go down that track. Would it be not right to mitigate the problem now ? To NZ and Australia, we will one day come back and ask you both - WHERE WERE YOU WHEN I NEEDED YOU? What will you then be your reply? Sometimes I wonder that maybe, maybe, we should look elsewhere like Frank is now doing! Arrest #1 & #2. Arrest Pryde; Gates & Sharon. Lock them all up in Naboro. Get rid of all the present Ministers and President. Slap travel ban on them and all others that were involved in the coup including Aziz etc until we take them all to court. Have an Interim govt with a view to election in 12 months. And people be allowed to form parties and campaign from now on. Army to be reduced in half. Get rid of all renegade soldiers. You hand pick those to stay. All personel to hand in all weapons to be guarded by loyal soldiers. I am sure there are people blogging here who would be capable of running the Interim govt for 12 moths. Interview them and check their CV. Stop all China and India deals untill all are scrutinised. As the old saying goes, let's just bide the time, aye. . . soon, Frank will be here asking for help. A subordinate has just paved the way! Isa o Epeli.....Epeli Nailatikau.....sega na kemu yaga.............Achieved nothing on your own.......only because of the name.........useless as a Commander.......the name got you an Ambassadorship and everything after that..........not a very smart cookie......surviving on handouts! If you can make President....I will become Sec Gen of the UN! Sa rauta mada na vei con taki tiko. Rest assured bro - any plans we do have - certaintly won't be sharing with likes of you. You chose your bed - now lie in it. Eveli Nailatikau, mino na kemu yaga, curu vakavanua ena veitutu vakamatanitu kecega because of your name, may be. One word best discribes what will happen to the evil doers "KARMA"
The World is a dangerous place to live, not because of the people who are evil, but because of the people who dont do anything about it.......Albert Einstein. Proverbs 23:17 Do not let your heart envy sinners, but always be zealous for the fear of the LORD. #1 needs to be weary of the close associates of his former land force commanders, what goes around comes around. they still there in the camp. with hidden agendas we not going to see democracy!!!!! IT SEEMS THAT SOME PEOPLE ARE TALKIN FROM HEAR SAY TOPICS...WHAT ID LIKE TO STRESS IS..BAI HOSTING THE RUGBY TEAM AT HIS HOME IS HIS BUSINESS AND FOR YOUR INFO...ALL COMMANDERS HAVE THEIR DRIVERS TO TAKE THEM HOME IF THEY ARE IN THAT SITUATION...IF U ARE NOT A FIJI CITIZEN...THEN PLIS LET US SOLVE OUR OWN...AND BELIEVE ME...WE CAN DO IT...FOR YOU KIWIS AND AUSSIES...IF U LOVE OUR COUNTRY MAYBE BECAUSE YOUVE BEEN HIA ON HOLIDAY OR WITH FRENS...PLIS LOOK INTO THE MIRROR BEFORE YOU TALK...YOU KIWIS HAVE THE MAORIS TO THINK ABOUT...WHILE YOU AUSSIES HAVE THE ABO...JUST SETTLE THIS ISSUE BY GIVING THEM WHATS RIGHTFULLY THERES...THEN MAYBE OUR GOOD LORD WILL ALLOW YOU TO HAVE A SAY TOWARDS US..
Repent for the Kingdom of Heaven is near....that is all we have to do....we might have our say on this and that, but fellow FIJIANS heads up and leave everything to GOD himself.....vinaka..
why only talk of Bainimarama and khaiyum Bainimarama? What about other master mover and treasonist? she was the master mover. Made tens of millions.big fish naaz shameem.She knows she will get caught so left. Was injustice shameem not the same woman who was responsible to save former Fiji Times journalist Yunus Rasheed when he killed the man from Brisbane and his daughter then dumped them near Navua river making it look like car accident in 1995 or thereabout. It was her payback for him in his days at Fiji Times as journalist in promoting her as a judge. Sure she is the same snake.